ALEXANDER STEPHENS. 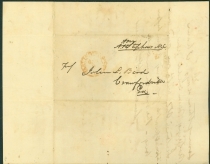 Autograph Letter Signed, to John L. Bird, January 8, 1844, Washington, D.C. With integral address leaf franked “Free A.H. Stephens MC.” 3 pp., 8 x 10 in. Andrew Jackson had been fined $1,000 for detaining a federal judge and unconstitutionally imposing martial law in New Orleans immediately following his famous victory over the British on January 8, 1815. 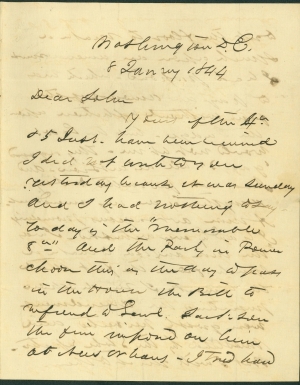 Jackson called on his allies in Congress in 1842 to pass a bill refunding the fine. His enemies within The Whig party, which controlled both the House and Senate, flatly rejected the proposal. But Democrats, looking for a rallying cry in an election year, successfully seized upon the issue and used Jackson’s status as a war hero to take back the House in the next election. On the date of this letter – the twenty-ninth anniversary of the Battle of New Orleans – Democrats passed a bill providing for the refund by a landslide. Alexander H. Stephens (1812-1883) was born in Georgia and graduated from the University of Georgia in 1832. He established a law practice in Crawfordville, Georgia, where he acquired land and slaves. He served in the Georgia legislature from 1836 to 1842. He served in the U.S. House of Representatives from 1843-1859. In 1862, he became the first and only Vice President of the Confederate States of America. He was one of three peace commissioners who met with President Lincoln and Secretary of State William H. Seward in Hampton Roads, Virginia, in February 1865, in an unsuccessful attempt to negotiate an end to the war. After the war, Stephens was imprisoned for five months. He served in the U.S. House of Representatives again from 1873 to 1882 and briefly as Governor of Georgia during the last five months of his life.